Reliable and efficient transport of your goods at reasonable prices! 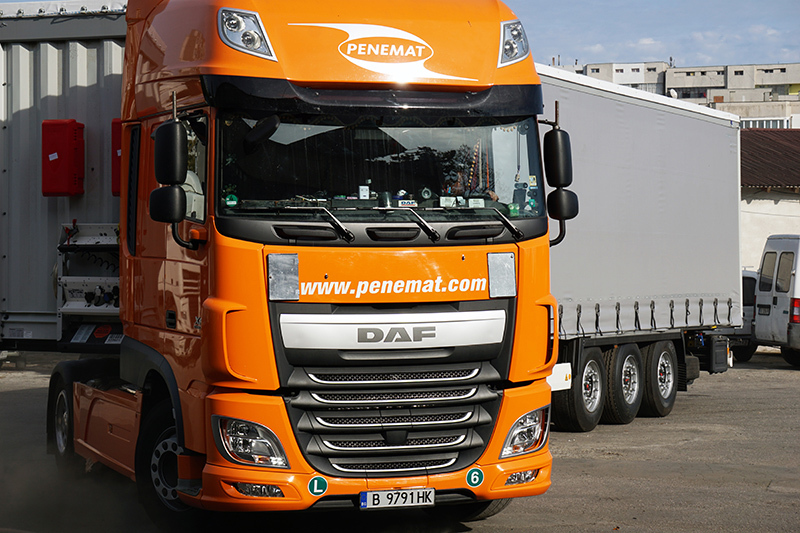 We mainly transport goods around Western Europe and between Bulgaria and Western Europe, in particular Germany, France, the Netherlands, Switzerland, Luxembourg, Belgium, Spain, Italy, Poland, Denmark, Portugal, Austria, Sweden and the UK. We have over 100 Euro 5 and Euro 6 tractor-trailer combinations freight compositions or trucks and trailers whose average age is 3 years. We professionally repair our vehicles at our own service shop. Since June 2017, we have also been an authorised DAF service point, which means we are allowed to carry out repairs, maintenance and warranty servicing on freight vehicles to the DAF standard. We have a service shop with an indoor service hall and highly-qualified mechanics, including 2 mobile teams specialising in the provision of roadside assistance with the help of fully equipped vans. 1991 – Dipl. Eng. Emil Penev founds the sole trader business ET Penemat in Varna. At this time, the company has 1 cargo vehicle.